Each of Janet Ayliffe’s paintings is like an intricate recapturing of moments from the kaleidoscope of her life. Join Janet as she wanders the shores of Kangaroo Island, capturing these moments in her notebooks. Janet Ayliffe has been a printmaker and painter for more than forty years. Born on Kangaroo Island, she spent most of her first eighteen years there, and to this day returns regularly for fresh inspiration. As soon as she could walk, Janet set out to explore the scrublands and waterways of her family farm. Later with her new “Dad tin canoe”, she travelled the shoreline of Western Cove, and on the old horse, ‘Fatty Nogs’, over the valleys and up to the high hills. At home Janet made drawings of the wondrous places she had seen with charcoal on walls – all creatures who flew, walked, swam or slithered. Drawing space soon ran out. So then to paper, sheets and sheets of paper…over etching plates and into wood blocks, the pictures went on. Pictures and drawings of her heartland, on this Long Ago Island. Janet Ayliffe is an award-winning painter and printmaker. She graduated in Fine Art Painting from the South Australian School of Art. Winner of the 2006 Waterhouse Natural History Art Prize for works on paper and several times Waterhouse Prize and Fremantle Print Award finalist, Janet is represented in public and private collections in Australia and internationally. In 2016 Janet’s work was included in the Benetton collection, Milan. Married with three children, Janet lives at Kangarilla, in the Adelaide Hills, which is where she works on her paintings, etchings and wood engravings when not visiting Kangaroo Island. “I was born in 1950, half way through a storm, night, year and century. The Island was my home until I was in my early 20’s. I live now, and for over 30 years, at Kangarilla, with my husband Glen and our three boys. My painting on walls and verandas has continued to many pieces of paper and etching plates, covered with the Blue Stars, Donkeys, and Spider orchids, Snotty-gobble vines, and various long Island stories. I return often to my loved family, the farm and Nepean Bay. 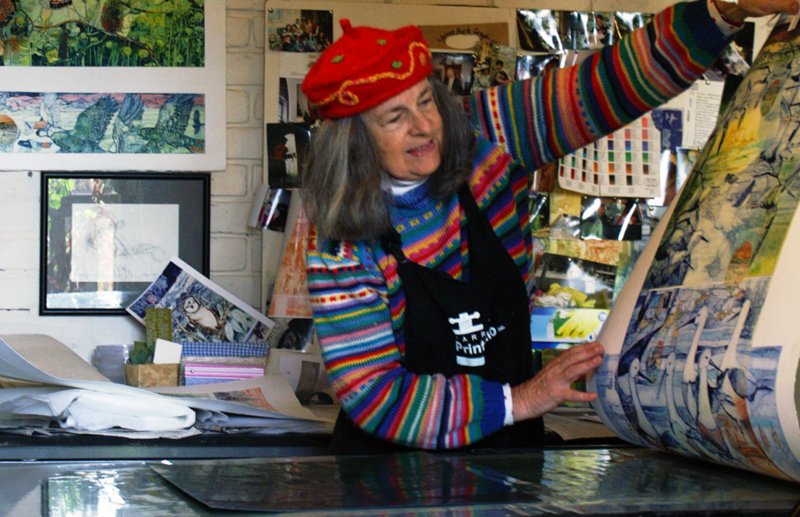 Janet Ayliffe at work in her private studio. Janet frequently spends time meeting and talking with visitors to our Kingscote Gallery, being one of our regular visiting artists. She has also exhibited in each of our annual themed exhibitions for the SA Living Artists (SALA) Festival at the National Wine Centre. Janet has made available a selection of her best known works for sale in our online store. These high quality reproductions have been produced in Janet’s studio, and feature a hand-embossed inclusion. To order your own limited edition Janet Ayliffe print from our online store here. If you wish to purchase a Janet Ayliffe painting that is not available for online ordering, you can still purchase by getting in touch with us. For telephone or email contact, go to our contact page. Call into Fine Art Kangaroo Island to view and purchase framed or unframed.